By Katía Truijen, December 7, 2014 at 3:33 pm . 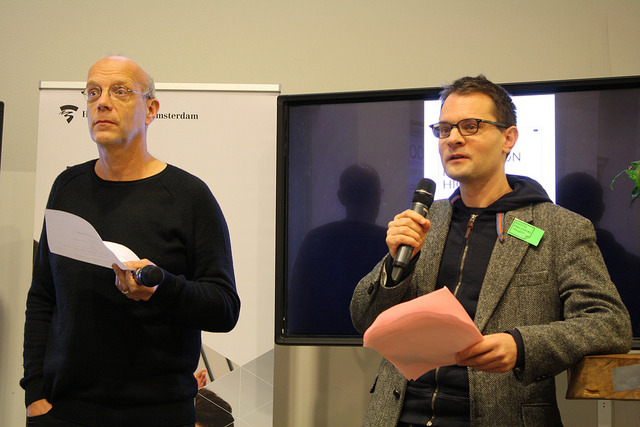 Geert Lovink and Florian Cramer conclude the afternoon by looking back on two years of researching digital publishing; a succesful collaboration between designers, schools, researchers and publishers. Which lessons can we take from the research? When one compares reading and publishing to other media that have been digitized over the past decades, one will see that publishing has followed a different path. Indeed the field is changing, partly even in a disruptive way, but it has not changed like the music industry, newspaper industry or online video where one can see a consolidation of business models. In general, the publishing industry is still somewhat conservative compared to other industries like those of magazines and journals. In these fields there is a lot of experimentation and the Netherlands can even be considered to be a pioneer with projects and business models like Blendle and de Correspondent. In other countries one can already find some examples of distribution platforms for small publishers, like Minimore.de in Germany. The fact that digital publishing is still in a transitional phase, is at the same time very interesting. We may say that we are in the ‘Napster moment’ in the printing industry. Geert Lovink states that when you compare it to the rise of the Internet, it feels very much like 1995. The systems are not yet working, but there is a lot of experiment and research into different standards and platforms. 2. The electronic medium is often still (used as) a poor medium. Maybe digital publishing will remain in transition for the next couple of years. Although there are no ‘solutions’ for the industry yet, a lot has been achieved in the last two years. Effective working approaches have been developed that work well in this transition phase. As an overall conclusion one can state that much of these working methods actually defy the expectations of what is paper and what is electronic. The findings often have been counter-intuitive. For example, the main expectations with electronic media is that they allow for rich media, but there is still not much experimentation in this field. Video is not often integrated into books to enrich the reading experience. Why are multimedia books still rarely made? Universities, art academies and applied universities still don’t combine their expertise so much. In the field of filmstudies there are still books on films instead of multimedia books. Another barrier is that multimedia books would easily become multigigabyte files. Moreover, it is very hard to get all the rights from film studios to include their movies. But some of the obstacles also bring new opportunities. For example, digital publishing allows for the creation of very small formats that would never be printed as a book, like a one-poem-publication. In the triangle of authors, designers and publishers, there is now another role to take into account. In digital publishing, the role of the programmer has become very important. This means that people have to collaborate in new and different ways. All traditional roles have to be redefined to a certain extent. The project of the Digital Publishing Toolkit mainly focused on design and production questions in collaboration with publishers. More research has to be done on distribution and business models. These issues are highly important for authors and publishers. In the Netherlands there is an urgency to develop new formats for journals, especially because there have been serious budget cuts in this field. Very often there is a magic expectation that digitization will solve all problems. Indeed, more readers can be reached with digital publishing, but the idea that it is cheaper than a printed version is a myth. Often it is very hard to make money with digital content. A compromise to simply export a print version into an epub often doesn’t work at all. Different media ask for different workflows and specific approaches. The two main places for books – the library and the bookshop – changed dramatically with the rise of digital publishing. It has an enormous impact on these environments, that are forced to reinvent themselves. It would be good to extend the research on digital publishing and take the wider urban context into account. The transformation of the bookshop and the library have a direct link to the developments of e-books. What would be the future of the bookstore and the library? 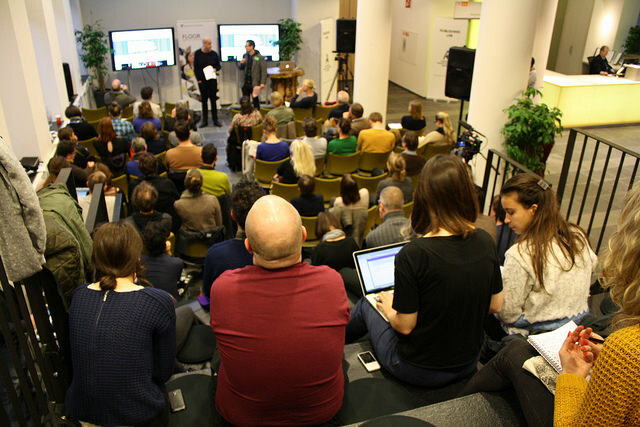 Libraries may be redefined as centers for digital literacy. After all, there is a lot of expertise to be found in these environments. Another interesting development to research is social reading. What tools can we use in classes to combine deep reading of a text with discussion? The dystopian version of the future electronic bookmarket would be an iTunes or NetFlix model. In the future there may be big commercial providers that will offer full education packages that give access to all books and publications. If schools subscribe to these kinds of licences, libraries will be shut down. We should be aware of this kind of neoliberal optimization of educational resources. If we don’t develop alternatives, it may be too late.